Join Lesley Riley in 52 PickUp: A Year of Inspiration and Motivation, delivered weekly to your inbox. Now's your chance to hop in for 1/2 the year at 1/2 the price! Make the rest of 2013 your year to stay on track, stay inspired, stay focused and stay accountable to your dreams. 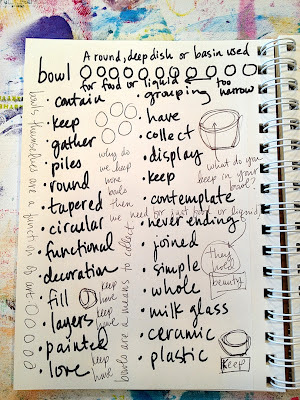 Jane LaFazio is offering her popular online class "Sketching and Watercolor in a Mixed Media Journal" for people who already know how to draw, and have had a teeny bit of experience with watercolor. 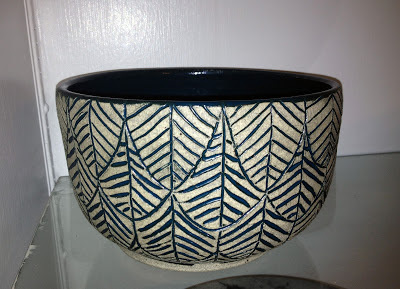 Class starts June 23, details here. Jane is also teaching at CREATE in New Jersey (in July) and CREATE in Chicago (in August). And, at Art Unraveled in Phoenix (in August). "Mastering Twinks" with Dion Dior. "Mastering Twinks 1" with Dion Dior from Dion Dior on Vimeo. Part 1, "Twinkling Discoveries" begins on July 11th, 2013, and after today, the cost of registration goes up. If you sign up anytime throughout June, you'll automatically go into the draw to win the Mastering Twinks Prize Pack. Dion is giving away a beautiful Stillman & Birn, 5 1/2 x 8 1/2 "Zeta" series sketchbook (with her art on the cover), plus a Koi Waterbrush, and a selection of 3 large pots of Twinkling H2O's. All registered participants get a Luminarte 15% Off Coupon which can be used to buy ANY Luminarte, including any of the new Dion Dior Twinkling H2O Color Packs. The giveaway runs for the month of June only, click here for more information or to register. boy, where has the month gone? 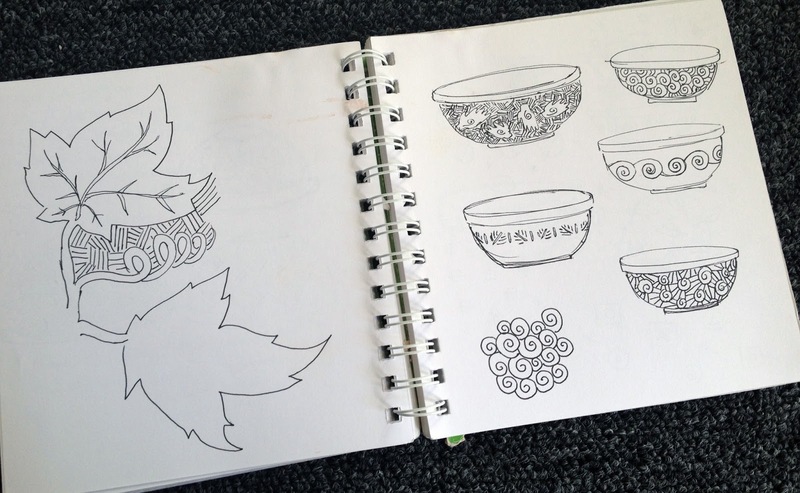 I was really excited about this theme when Lesley announced it because I love drawing and making bowls. 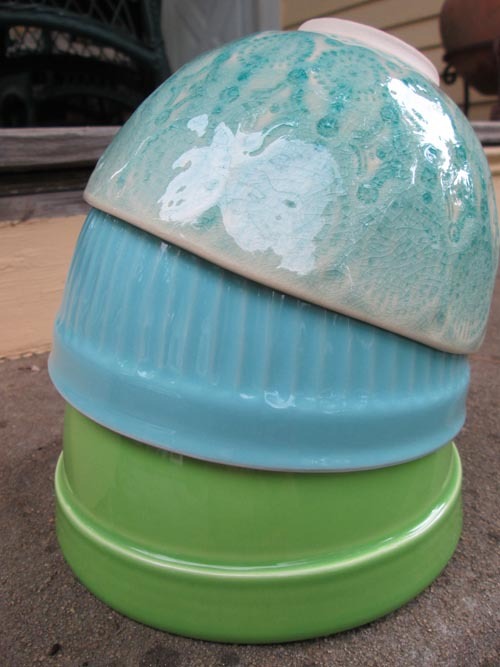 When I lived in Austin I spent several years doing pottery. I think clay has to be my second favorite medium to work in after fabric. 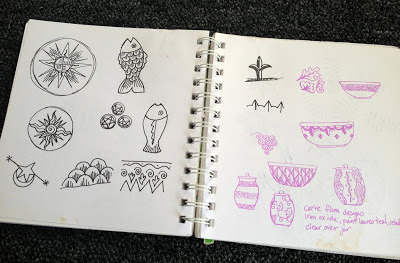 If you are familiar with my work you'll probably see a lot of overlap of decorative motifs from my pottery to my quilts. I liked to glaze my pots very similarly to how I free motion-quilt. 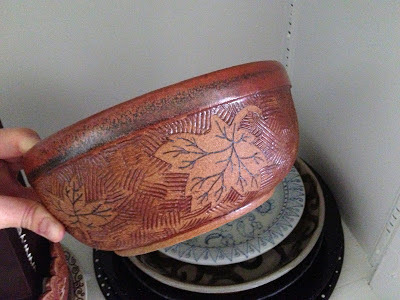 I also loved carving the surface of my bowls, giving them texture in the same way I think quilting gives dimensional texture to the surface of a quilt. 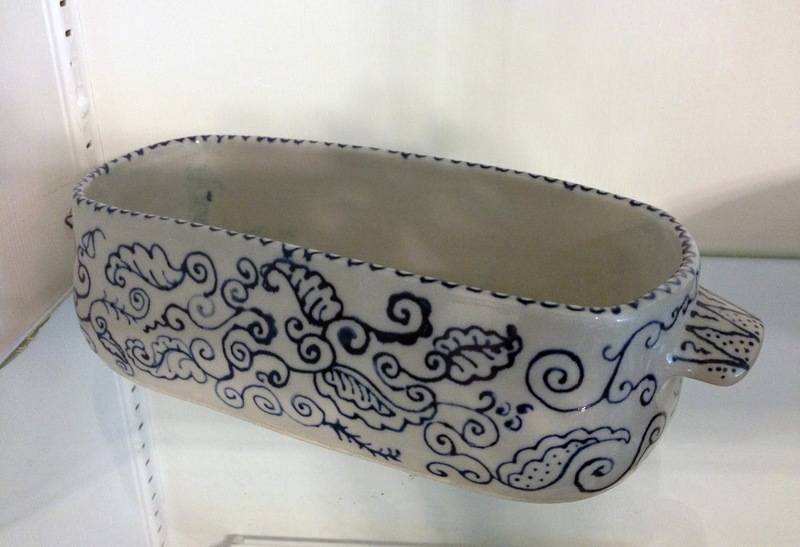 This is a double wall bowl. 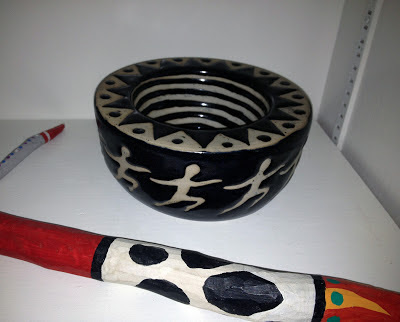 It's thrown upside down on the wheel, by first pulling up the center of the clay to form a closed dome that becomes the inner bowl, then you pull up a second outer wall to finish it, giving it the look of a thick heavy bowl. 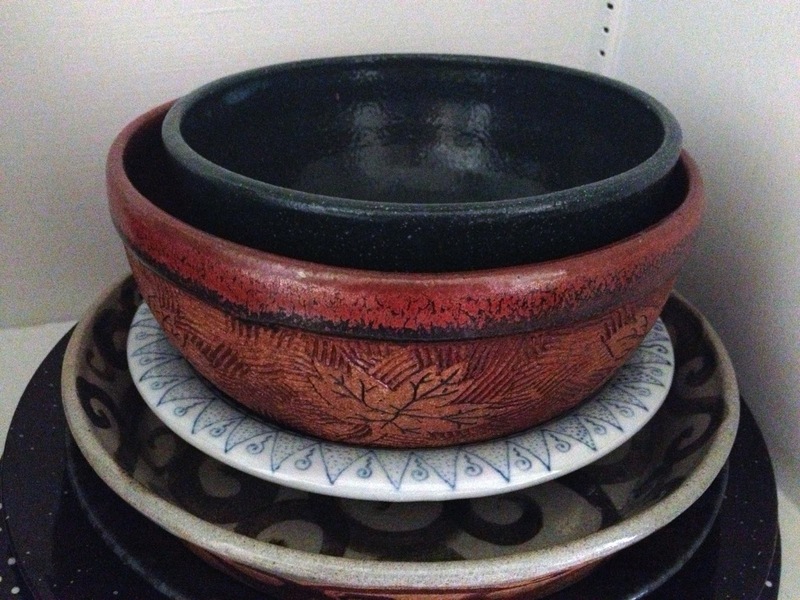 I also made a few bowls that weren't round. I just wish I still had the time to make them too. 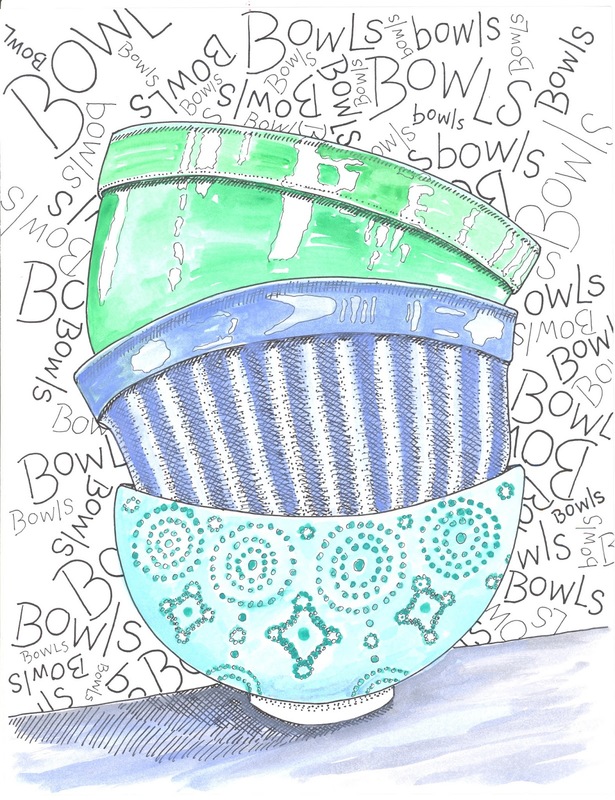 I have to admit that when I heard the theme for this month is bowls, I got a big smile on my face. I'm a bowl junkie. Particularly white milk glass bowls, I collect them like my life depends on it. And pretty much anything else that I want to keep tidy. So I was feeling rather inspired about the theme! I started out as I usually do, looking up the definition of the word to see if I could gain a jumping off point for that. 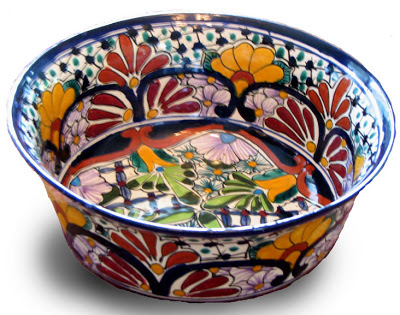 Here is the definition of "bowl": A round, deep dish or basin used for food or liquid. What a snooze fest, right? Nothing exciting there. 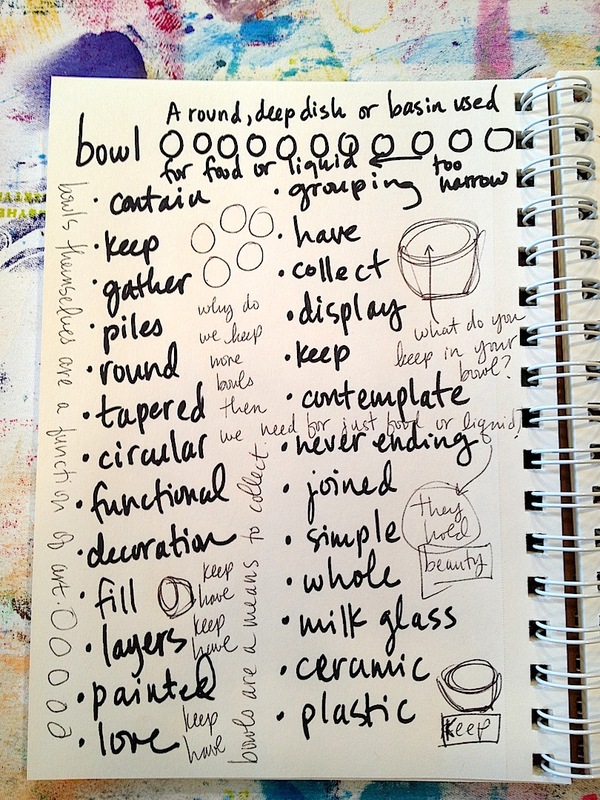 So I decided to pull out my sketchbook and make a list of words that I associate with "bowl." That's got a little bit more of a pulse to it, doesn't it? Nouns, some emotion tied in there, a little daydreaming. Mostly I kept thinking about how we use them to hold things, to keep them safe. So I set about the idea of creating a collage that would mimic the feeling of trapping one thing inside another. 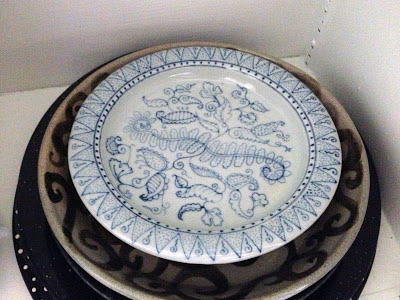 And ended up with something that conveys the two biggest things I associate with bowls: containing something precious (my painted scraps of fabric) and circles. Is this the most beautiful thing I've ever created? Absolutely not. It's fairly homely, if you ask me. But I don't think that everything I make has to be great. Or even good, for that matter. 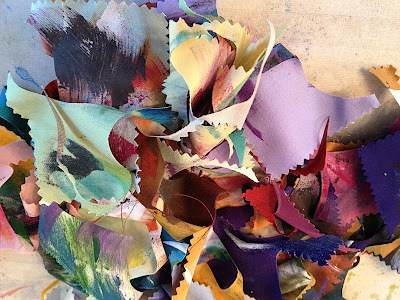 Aside from the fact that this is being added to the Part Pile for a larger collage, making art is about just making sometimes. Not everything has to result in perfection. And here's what I mean when I say it's going into the Part Pile - I make small collages like this in order to cut them up and reduce them even further for use in large collages. I want to make a giant one, bigger then I've ever attempted. But I need a lot of parts. I'm aiming for 50 in the Pile before I start slicing and dicing. So it's okay that this doesn't scream beauty and loveliness and all things wonderful. It will be incorporated into a larger whole, combined to work with many other components. And that, to me, is what is really at the core of making art - always changing and twisting and growing. Terry Grant here. 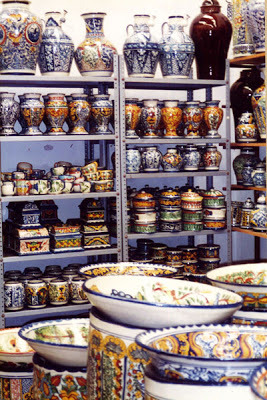 I love, love, LOVE Mexican Talavera pottery. There is something so joyous and festive about it and it is gaudy and wild and usually painted with my favorite warm, rich colors. Years ago on a trip to Mexico I bought a Talavera bowl in the little town of Dolores Hidalgo. This is where they are made. 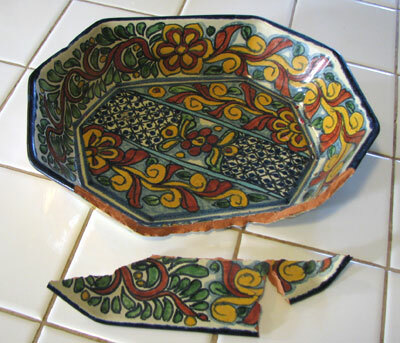 I loved my bowl for many years and then one day my husband picked it up to move it and it fell to pieces in his hands. I was heartbroken. I wrote about it on my blog. Then I got an email from Kelley Wilkinson, someone I have never met, nor even know from blogging or email lists. She said, "I live in Dolores Hidalgo. I will send you another bowl." We corresponded. Her intent was to find one as close to the other as possible or even arrange to have one made to copy the old one. Time went by and I didn't hear from her. I assumed life had gotten in the way or that her initial generous impulse had come to its senses! But at last I got another email and she said she was sending the bowl. She said she had not been able to find one the same shape as the original, but hoped I would like the one she was sending. When it arrived I was stunned. It was beautiful. I offered to pay Kelly for it, but she refused. It was a gift, she replied, with no strings attached. I learned that Kelley and her family own a historic hacienda in Mexico that they have turned into an inn and spa. I sent her a small piece of my artwork as a thank you. 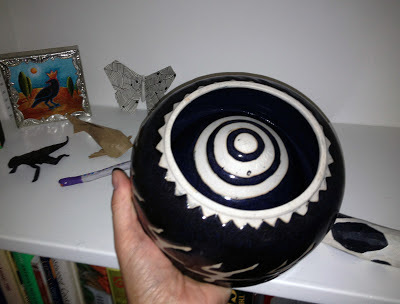 I look at my beautiful Talavera bowl every day and think of the incredible kindness and generosity of a total stranger. The bowl holds fruit in our kitchen and brightens every day. This morning I set it on the dining room table and did a quick watercolor sketch. BTW, I mended the broken bowl and it does light duty, holding our napkins. 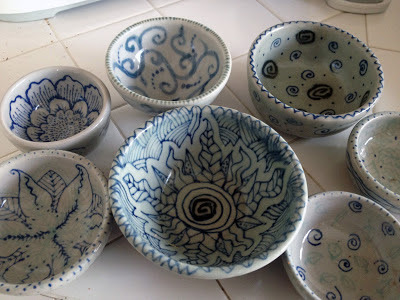 They are magic bowls. Hi, it's Kristin. 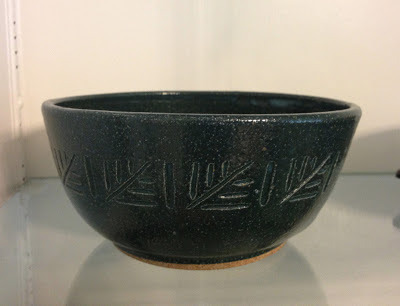 I have a set of bowls from the 40s given to me by my great grandmother. 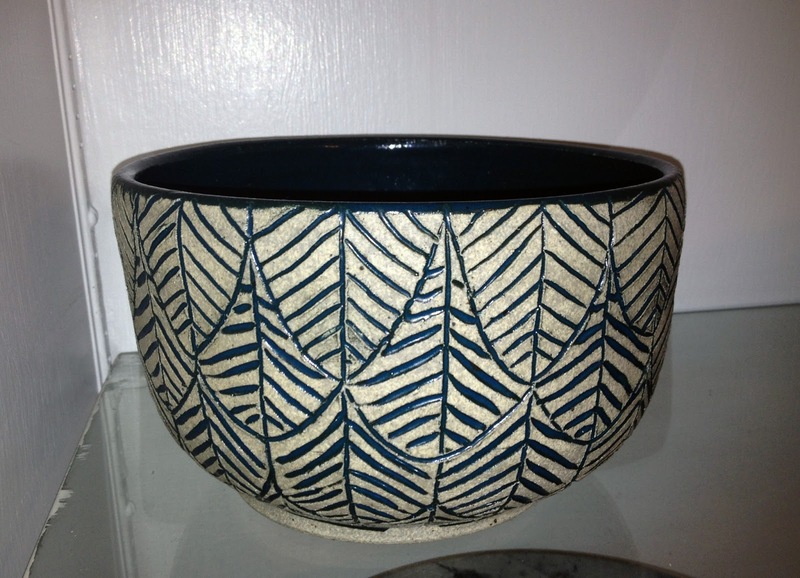 They inspired a whole collection of post-war California pottery, but that's another story. 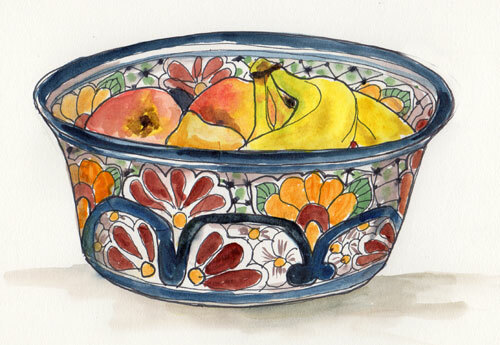 For now, I just knew that the set was what I wanted to draw for this month's Bowl theme. I love how the bowls nest, so I set them on the floor and drew them from above. Just using one pen, it was an exercise in cross hatching. I admire a good cross hatch. I am lacking, but the more I practice, the more improvement I see. 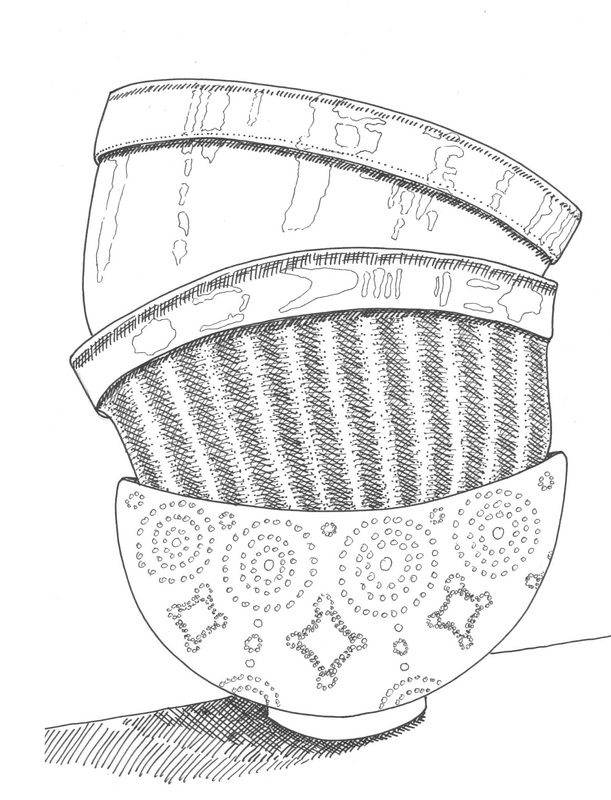 It seems that cross hatch techniques are kind of like fingerprints too -- everyone's style is a little different. Next, I loosened up a bit with a big fat Sharpie pen. I thought the bold pen looked good with the bold shape of the bowls. 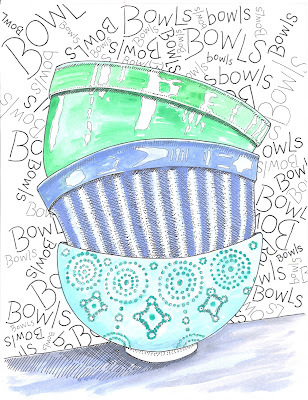 I wasn't in the mood to realize the drawing with a lot of color, but I couldn't resist a hint at the retro pastel hues of the bowls. Another great way of looking at a subject is to focus on the negative shape. I set up the bowls so they'd have a nice silhouette, and did a somewhat blind drawing of the spaces between. It turned out completely blah, so I just kept drawing, adding details and curves, and finally beefing up the edges with the Sharpie and adding a cross hatched ground. 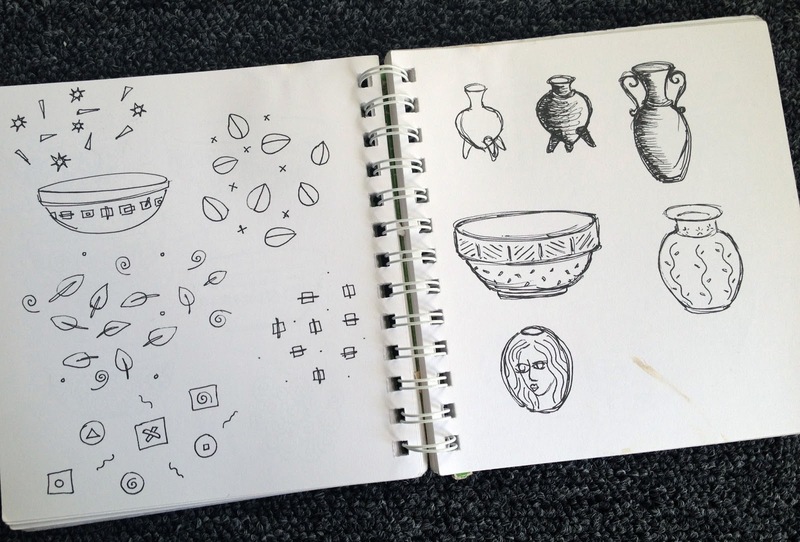 Sometimes what we set out to draw is not what we end up drawing. 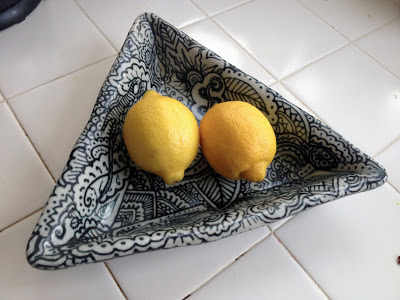 I enjoyed spending some time for a few days with my favorite bowls, and judging by the other posts this month, it looks like the rest of the crew has had fun raiding the shelves too. 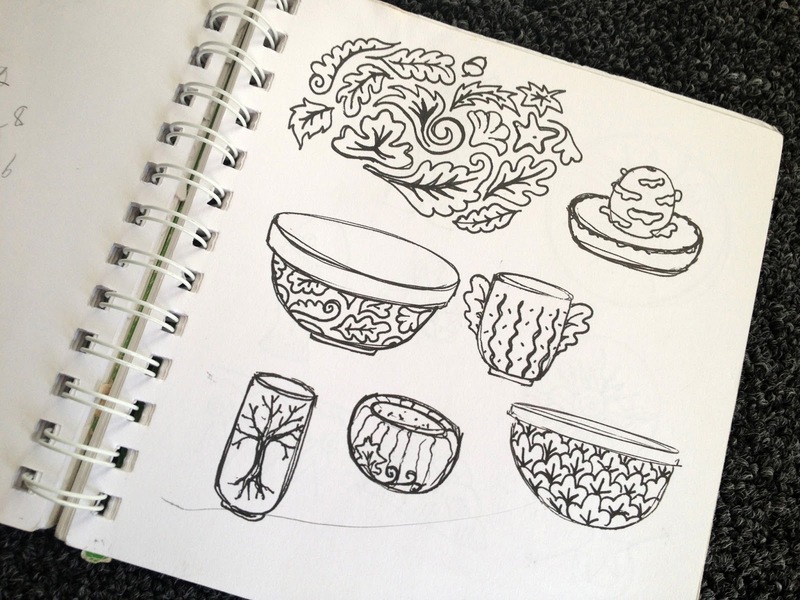 A humble subject like a favorite cup or bowl is a great vehicle for practicing and developing our skills. 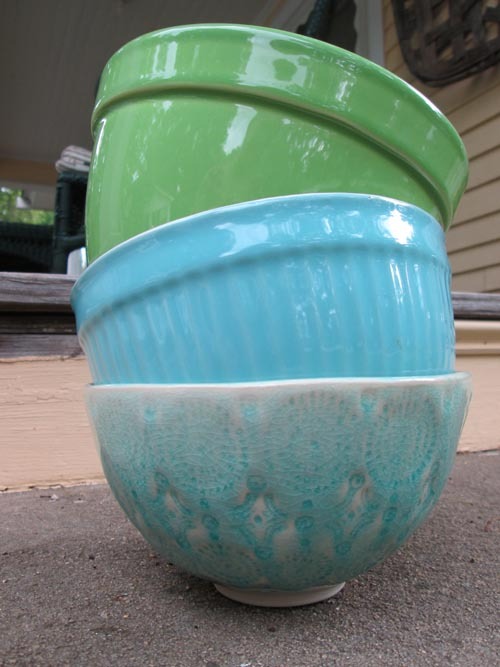 Susan Brubaker Knapp here with your bowls du jour. I started out by taking photos of some beautiful blue and green bowls I had in my cupboard. 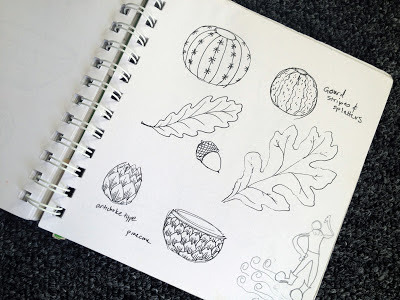 It’s handy for me to take photos and work from them because I’m often sketching on the run (this week, for example, is soccer tryout week, and I’m really on the go!). This way, I can print out the photo and sketch from it, where ever I am, and without schlepping the bowls with me, and hoping for decent light. 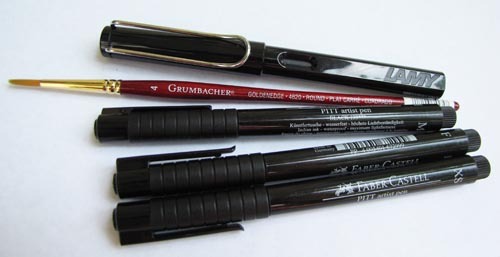 From the top: LAMY fountain pen with black ink; water color brush (#4 Goldenedge Round by Grumbacher); and Faber Castell PITT artist pens in a variety of sizes. Dear readers, what do you use and love? I’d love some suggestions! I think the text really gives it wonderful energy. Hi Everyone, Dion Dior here. 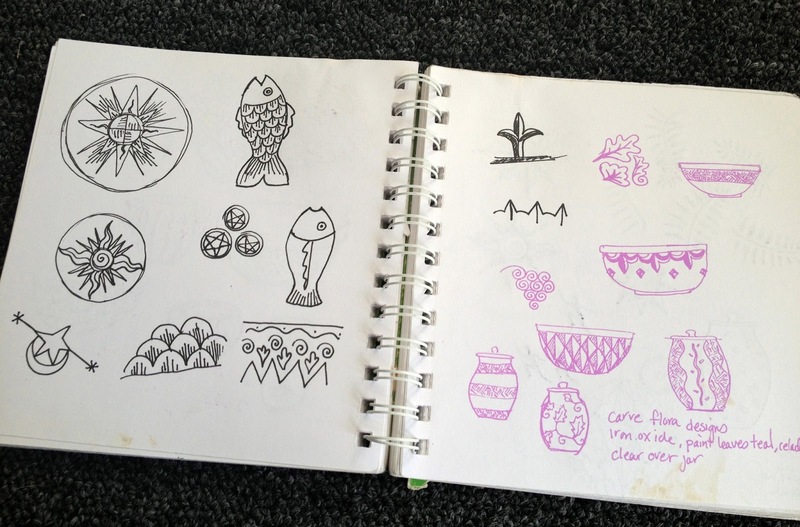 I get most of my sketchbook inspiration from nature. 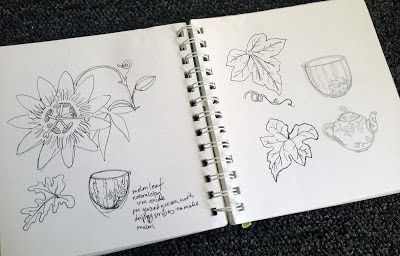 My journals and sketchbooks are filled with images and interpretations of nature, so in keeping with the May theme "Bowls", and the Northern Hemisphere season of Spring, I thought I'd share a little tutorial on how to draw bowl-shaped flowers. Begin with a dot on the page. This is the point where the stem of the flower will connect to the flower head. Draw a straight line coming from the dot in the direction that you want the flower to face, and a straight line in the direction of the stem. Draw a small oval just above this dot, this is the base of the flower head, and a larger oval above the small one, this is the opening of the flower. Next draw straight lines indicating the edges of the flower. These lines should connect from the dot to the very edges of the larger oval. Draw a petal originating from the dot on the lower edge of the small oval, and finishing at the lower edge of the large oval. This is your front facing petal. Draw the outside petals, making sure they are narrower than the first one. This is because you are viewing these petals from the side and they will appear thinner. You can tuck them behind the front petal if you choose. Make sure all your front petals end at the lower edge of the large oval. These petals will start on the top edge of the small oval, but you don't need to show this, the bottom part of these back petals are hidden behind the front row. All of your back petals will end on the top edge of the large oval. 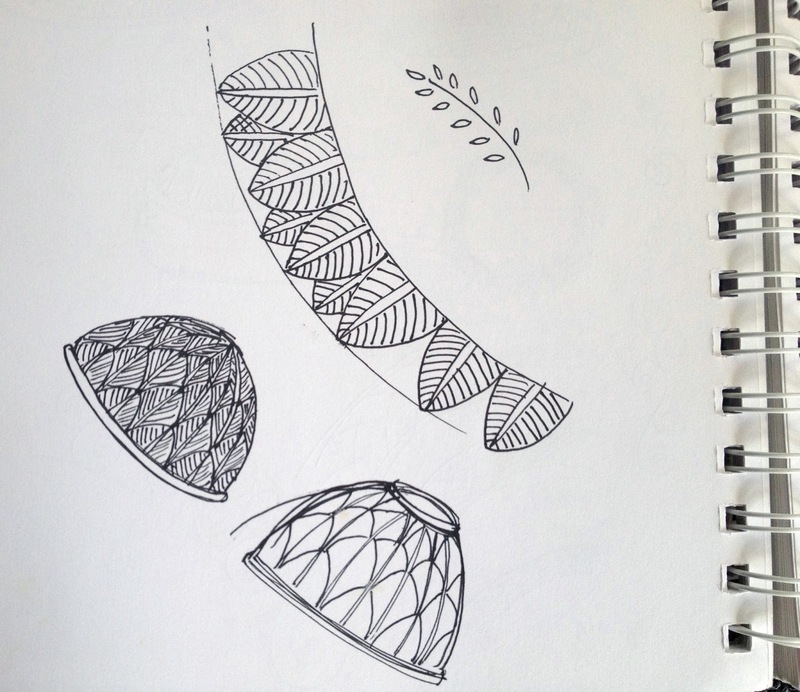 Keep the shape of your flower as close as possible within the guidelines you have drawn. Draw in the stem and the center of the flowers. Keep the center tucked behind the front petals. Draw in some foliage or leaves. I used a water soluble marker to show you how to shade your flower. Think about what parts of the flower are in shadow, where the petals sit behind each other, and how the foliage rolls. Drawing bowl-shaped flowers is quite simple, and the concept of a center point and two ovals can be applied to many types of flowers. 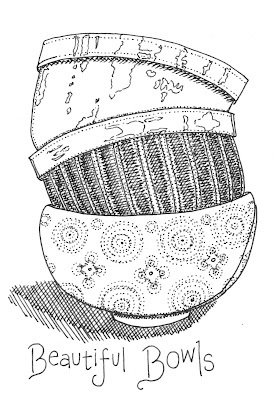 it is a basket or a bowl?